Size: Length 12″ , Width 08″ , Height 24″ approx. The inner dimensions : 11″ x 7″ x 11″ in inches approx. 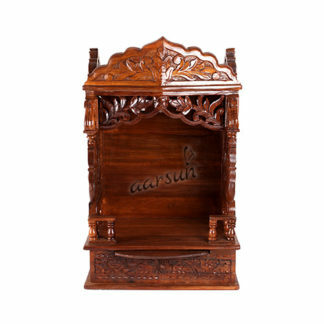 Aarsun Woods presents handmade Wooden Temple / Mandir / Pooja Ghar suitable for homes and offices. The wooden temple is made from Rosewood with traditional carving and good finishing. Aarsun Woods brings to you Handmade Wooden Temple / Pooja Mandir for Home and Office. Instil positivity and blessings at home with our premium range of Home Temple suitable for all Homes & Offices. The Pooja Mandir consists of a Single Dome, 4 adjacent Shikar and one at the top of the Dome. The Dome is placed at the top of the steps style layers with floral carvings and braided design. The Garbgriha – central place of the Temple has 4 Pillars, Jaali at the Back, and Open Sides with Front Mehraab. Just below the Garbgriha of the Wooden temple, lies a small pull out drawer for your pooja essentials such as dhoop-sticks and matches. The Whole Mandir is supported by 4 small legs. Product Size: 12″ X 8″ X 24″ in inches approx. The inner dimensions: 11″ x 7″ x 11″ in inches approx. The unit is made in Sheesham Wood except for the Ply used at the ceiling and the base for stability and for keeping the Mandir light in weight. Rosewood is the most famous for high oil content making it smooth and thus giving this quality to our Wooden Temples. Sheesham wooden temple has medium texture to coarse with natural lustre. Sheesham wooden temple has a very indistinct color and gives very well finish after hand waxing. Some of our Sheesham Wooden Temples have wrought iron work which only is possible with Sheesham Wood as it goes with wrought iron very well. Handling Time: 7-10 business days.